You may have heard that a low-carb diet helps with weight loss and better health for diabetics, but exactly what constitutes "low-carb" is unclear. In 2007, the American Journal of Clinical Nutrition suggested that a low-carb diet consists of 50 to 150 grams daily. However, many research studies use diets with less than 100 grams of carbs daily to determine the benefits of low-carb diets, and some very-low-carb diets contain as little as 20 grams of carbs daily. The Institute of Medicine recommends you get 45 to 60 percent of your daily calories from carbs. For a standard 2,000-calorie diet, this amounts to between 225 and 300 grams daily. Eating fewer carbs than these recommendations makes your diet low in carbs, but going even lower is an effective way to bring about weight loss and improvements in cholesterol, insulin sensitivity and fasting blood sugar levels. Much research has confirmed the benefits of restricting carb intake, including a study published in the journal Lipids in 2009. Researchers showed that a diet restricted to 1,500 calories and about 45 grams of carbohydrates daily -- or 12 percent of total calories -- better improved symptoms of metabolic syndrome and induced greater weight loss compared to a 1,500-calorie, low-fat diet. Metabolic syndrome is a cluster of symptoms, such as a large waist and high fasting blood sugar level, that indicates an increased risk for type 2 diabetes and heart disease. People with diabetes also benefit from restricting their carbohydrate intake. A low-carb diet helped improve cholesterol levels and blood sugar levels in diabetics as compared to a traditional Mediterranean diet or a standard American Diabetes Association diet, accoring to 2014 research in Diabetes, Obesity and Metabolism. Low-carb diets, especially very-low-carb diets that are high in fat, have also successfully reduced the severity of epilepsy and could possibly be helpful for other conditions, including Alzheimer's and Parkinson’s diseases. Extremely low-carb, high-fat diets are often ketogenic, meaning they put you into a state of ketosis. Your body goes into this state when you don't have enough carbohydrates to provide energy. You produce ketones to use for energy instead. Production of ketones is normal, but not usual, when you eat the standard level of carbs recommended by the Institute of Medicine. Ketosis can be beneficial for weight loss because it encourages fat loss and zaps your hunger. A ketogenic diet calls for just 5 percent of your calories to come from carbs. For a standard 2,000-calorie diet, you'd consume just 25 grams of carbs per day -- approximately the amount in a small banana or 1/2 cup of brown rice. Phase 1 of Atkins and other high-fat, extremely low-carb regimens usually put you into ketosis. Meals on a ketogenic diet might include eggs and bacon for breakfast, chicken breast with romaine lettuce and olive oil dressing at lunch and lean steak with avocado and sauteed onions and peppers for dinner. Nuts, cheese and hard-boiled eggs make for low-carb snacks. A moderately low-carb diet of 50 to 150 grams daily is appropriate for someone who wants to lose weight but is willing to settle for a more gradual rate of loss. You may also choose a moderately low-carb diet if you exercise a lot and need the carbs for fuel. Diabetics whose condition is controlled also keep their intake of carbs moderate but don't have to skip carbs altogether. 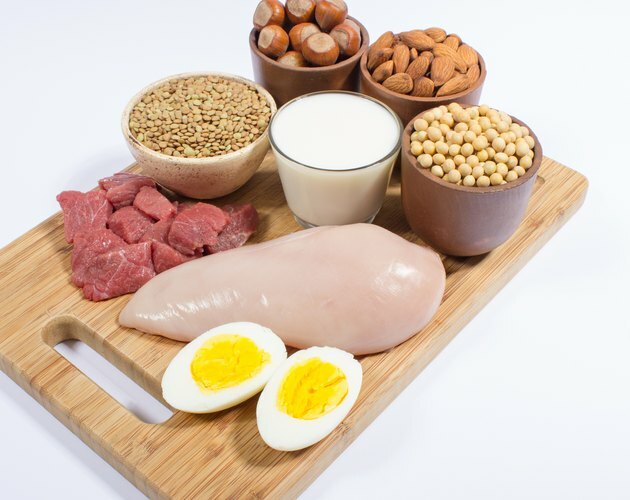 You may also find a ketogenic low-carb diet simply too hard to follow, but still want to experience some benefits of cutting out simple sugars and large portions of carbohydrates. Most moderately low-carb meals consist of a serving of lean protein, including skinless poultry, lean cuts of steak or white fish. Healthy fats such as avocados, nuts, salmon and olive oil are also featured at most sittings. Add watery, fibrous vegetables as part of a low-carb or ketogenic diet. Options such as leafy greens, broccoli, radishes, celery, peppers and cucumber are examples that don't contain more than 1 to 3 grams of carbs per serving. To fill up the 50 to 150 grams of carbs daily, you might consume 1/2 cup of brown rice at one or two meals. Each 1/2 cup has 22 grams of carbohydrates. At other meals, you might include small servings of milk or yogurt, berries and even 1/4 cup of black or kidney beans in salad or chili. When you do choose carbs, opt for the most nutritious options of whole grains, vegetables and fresh fruits. Should You Adopt a Low-Carb Diet? If you need to address obesity, diabetes or brain dysregulation, such as epilepsy, then a low-carb plan might just be for you. While many people have success on a low-carb plan, it's not the only way to lose weight or manage medical conditions. If you're interested in following a low-carb diet, talk to your doctor first to make sure it's OK for you. To eat a moderately low-carb diet, you don't necessarily have to precisely count every carbohydrate that goes into your mouth. Rather, avoid high-carb foods, including grains, breads, starchy vegetables, pasta, sugar and fruits. Fruit juices and milk contain significant amounts of carbs, too. When you reduce carbs, especially to the low levels required to induce ketosis, you may experience negative side effects that include headache, constipation and bad breath, and you may feel fatigued, too. These symptoms usually last only a few weeks, but they can persist for some people. Consult your doctor before starting an extremely low-carb diet because it is inappropriate for certain people, such as pregnant women and those on blood-sugar-lowering medication. Authority Nutrition: What Is Ketosis? Is a Low-Carb Diet Good for Hypothyroidism?